Ontdek enkele van de meest spectaculaire UNESCO-werelderfgoedlocaties van China tijdens een dagvip-rondleiding door de Verboden Stad en de Badaling Grote Muurruïnes uit Beijing. Begeleid door een ervaren gids, vang een zeldzame glimp op van twee minder openbare plaatsen in de Verboden Stad en verken de Schatgalerie en de Clock Exhibition Hall van het Palace Museum in relatieve eenzaamheid. Ga vervolgens naar de sfeervolle ruïnes van de Grote Muur om een ​​fascinerend inzicht te krijgen in China's grootste technische prestatie. Geniet van een bourgondisch feest van Pekingeend om deze verrijkende en exclusieve ervaring te besluiten. Verken minder bekende delen van de Verboden Stad en geniet van een Pekingeend-lunch tijdens deze all-inclusive tour. Vertrek vanuit je hotel in Beijing in een comfortabele minibus met airconditioning en begin aan de schilderachtige reis naar de Verboden Stad, een keizerlijk paleiscomplex van 74 hectare dat vroeger de thuis was van een opeenvolging van extravagante keizers. Begin aan een uitgebreide rondleiding door de UNESCO-werelderfgoed-lijst met je deskundige gids en verken 's werelds grootste verzameling oude houten constructies. Luister terwijl je gids de mysteries onthult rond eeuwenoude voorwerpen zoals een Jade Cabbage en ontdek de glinsterende geneugten van de Treasure Hall voor inzicht in de culturele betekenis van parel, goud en zilver. Ga vervolgens naar de Clock Exhibition Hall om meer dan 200 klokken en horloges te bewonderen; luister naar het resonerende klokkenspel van een koninklijk Qing-dynastiestuk en kijk naar de grootste waterklok van China, die op een verbluffende hoogte van 6 meter staat. Na een grondige verkenning van de enigmatische Verboden Stad, stijg je op naar Jingshan Hill, het hoogste punt van Beijing, om een ​​prachtig uitzicht te bewonderen over de stadsuitbreiding. Zie prachtige keizerlijke tuinen en daal vervolgens af om te smullen van een traditioneel Chinees banket met Pekingeend. Sluit je tour af met een bezoek aan de onlangs geopende Ruïnes van de Grote Muur, een geïsoleerde site die rustige verkenning biedt van vervallen binnenplaatsen en oude torens. Verrijk uw kennis van de geschiedenis van de Grote Muur en maak tijdens het wandelen foto's van de schilderachtige omgeving. Keer terug naar je voertuig en ontspan je tijdens de reis terug naar Beijing, waar de tour eindigt. 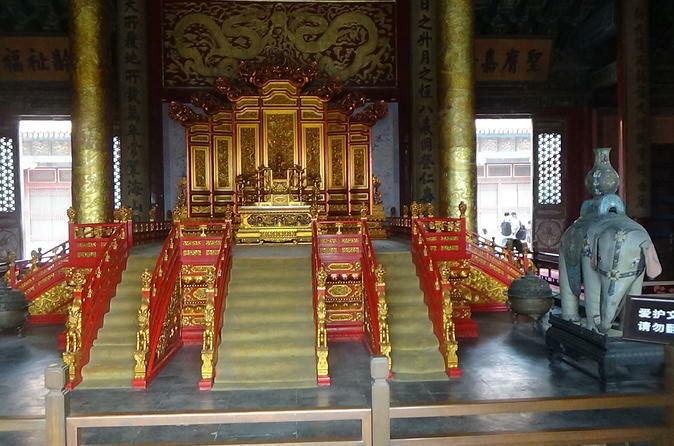 Seeing the Forbidden City is absolutely necessary in Beijing, but a private tour is strongly recommended. It is crazy crowded every day, and even worse on the weekends. Group tours will slow you down, and you will not see areas of the City, like the Treasure room, that group tours do not see. Unbelievable history here. A highlight was having a calligraphy poster done by the master calligrapher of the Forbidden City. Super cool souvenir. The Great Wall Ruins at Badaling are quite a ride. Hardly any tourists in this area. It is quite a hike. Interesting to see, but not sure it is worth the trip. This tour is good, but not great. You stop for lunch at a restaurant attached to a Jade dealer. Tourist trap. On the way back, you stop at a tea dealer. Again, tourist trap. I don't expect this in a private tour. Forbidden City was great, but the rest of the day's activities were frankly not too special. Great way to see the wall. Avoids all the crowds and the car rides were filled with history and great sites. Our guide, Carolyn, and the driver arrived on time. We drove to the park, climbed to the top, and viewed the Forbidden City and all of Beijing. Great views. Next we headed to the Forbidden City. Carolyn was very knowledgeable, but avoided the main areas because there were too may tourists. But that's what we came to see! Instead we walked around the other areas. The treasures we saw were not very impressive and did not match the pictures. I sort of felt like we missed the true treasures due to repairs or something of that sort. We stopped at a silk place along the way. Then we headed off to the Great Wall. Stopped for lunch at a jade place. Lunch was peking Duck, but not very good. The tea was even luke-warm. Carolyn and the driver decided to take us to a remote section of the wall rather than the tourist section at Badaling. Honestly, we were disappointed. We climbed what we could but there really wasn't that much. Of course the views were great, but I can't help feeling that we missed out. Then we headed back into the city. We asked to see Tiannemen Square, so we did a drive-by. Also drove past the Bird's nest and Swim Cube. Then we headed back to the hotel. And that was it. 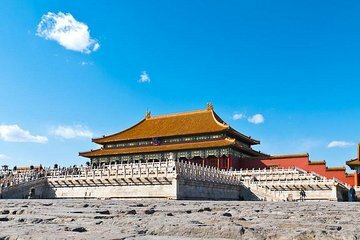 I booked the VIP Beijing's Forbidden City with Treasure Gallery and Great Wall for myself and three friends. It was an expensive tour but I thought it would be worth it because how often do you get to go to Beijing on vacation. The tour was suppose to start between 7:30 - 8:00am and would last until around 4:00pm. When no one showed up at the hotel we called and the company and we were told that the hotel was contacted and could not find our booking therefore, the guide was not coming. We explained that we were at the hotel and waiting and a guide finally showed up at 9:00am. We went to the Forbidden City first and it was okay -- our guide was somewhat knowledgeable but not very enthusiastic. The treasury room was completely under construction and there were only a few pieces of jade to see. Very disappointing but not the tour's fault. Next we went for lunch before visiting the Great Wall. The lunch was in a jade tourist trap sales room. We had to listen to an entire sales pitch for jade and then we were encourage to shop in the showroom with over priced statues and jewelry. Lunch was in a dirty side room and was mediocre at best. Lastly, we went to the Great Wall however, the guide said that the part of the wall we were supposed to go to would be too long of a walk so we were going to a different section. The section of wall he took us to was Badaling - and was okay - but crowded the MOST touristy part of the wall by far and not exceptional - and that would be fine if we had not paid so much money for the tour. Overall, the day was good - but not VIP good. The tour was announced as taking place when at least two passengers registered. It turned out that we were the only ones who had booked that tour that day. I was concerned that this could reduce the quality of the service, but I was mistaken. We had our very private tour with our own tour guide Jacky Lee and driver in an air-conditioned limousine. The guide provided a lot of details while visiting Tiananmen Square and the Forbidden City. On our wish he focused on the Treasure Gallery there. The Peking-duck lunch was good and provided you with some insights in the peculiarities of the Chinese cuisine. The day was a public holiday with loads of tourists at the Great Wall. Since the motorway was almost blocked, the tour guide redirected the tour to a lesser known part of the Wall that had also much fewer tourists and was more scenic. The Wall was much more steeper there, too. It was also a hot day at the beginning of August, and temperatures reached 38 degrees centigrade. It took us 1 1/2 hours to reach the top of the mountain and to return. However, we were rewarded with a most impressive view of the area with the winding wall on top of the ridge. We also visited a silk and a jade manufacture and a tea ceremony shop. I acquired a silk gown and a jade ball of life'', which symbolizes three spheres of prosperous successive generations. In the tea shop I came across Pu-erh tea for the first time. This tea comes from Yunnan and is from the same tea leaves as green tea. The difference is that Pu-erh undergoes a fermentation and oxidation process over many years I bought a ten year old block. The ferments include peptide-blockers which prohibit the storage of fat in the fat cells of the human body, for which the tea is also called slimming tea''. This effect is confirmed by chemists. In all this was a very rewarding tour which offers a cross-section of insights in Chinese historical and cultural achievements. We had the most amazing tour with our personal guide (Sue Lyn) and driver. We enjoyed Tiananmen Square, Forbidden City, went to a climb the Great Wall. Our guide even arranged a special lunch for my husband who has a very limited diet, while I enjoyed a very tasty Peking duck that was delicious! We very much enjoyed this tour. It was just my husband and me with a private guide named Goo. He was very knowledgeable and patient answering all our questions and explaining the Forbidden City. He took us to the Badaling section of the wall but beyond where the crowds are. We were virtually alone in a mountainous part of the wall. It was breathtakingly beautiful and the weather in May was perfection! This was a true highlight of our time in Beijing. Highly recommend and couldn't say enough nice things about our guide Goo. The quality of the tour was acceptable but not perfect. There were only two of us on this tour that day and all along the tour I felt that our guide was not doing his best, he made everything to finish the tour as fast as possible. Forbidden city treasury visit was left almost without comments and we rushed through the galleries of the forbidden city as if somebody was chasing us. Lunch was poor and beijing duck served was cold and disgusting. This was an excellent trip, the tour guide took us to a part of the wall, that was private and away from the crowds. After speking with other folks who went to the more touristy parts of the wall, I am so pleased we payed that bit extra and had the wall almost to ourselves. The guide was very knowledgable and kept us informed about the Forbidden city, we also went to a silk factory and other points of interest. Overall, money very well spent, would thoroughly recommend this trip to everyone.